Important information: Breastfeeding is best for babies. Period. You probably already know that I was not born and raised here – my family lives in Europe and I try to visit them as often as I can. Packing is overwhelming, particularly in the winter when the clothes are just huge and puffy and the boots are bulky and heavy. During my last visit my son was almost 18 months – he was walking and had his own snow boots and snow outfit and all these big things. It was a packing disaster. And of course I felt like we needed every single item we own. In the end I realized this was not feasible and something had to stay. Cutting the story short, I ended up taking just one bottle for Kamar’s water and tea in order to save precious space in our luggage (yes, he drinks baby tea – they sell it Europe). So off we flew to the other side of Atlantic with just one Safe Sippy. Soon I realized life was complicated using just one sippy cup. Eventually I gave in and decided to buy another bottle so that we can have one water bottle and one tea bottle (no need for a milk bottle – that comes right from the source). My parents live in a tiny town, no Safe Sippy to be found in the stores. I ended up getting some plastic NUK bottle – but hey, it was BPA-free so it passed (I guess). It had a manual. I guess everything has to have a manual nowadays. 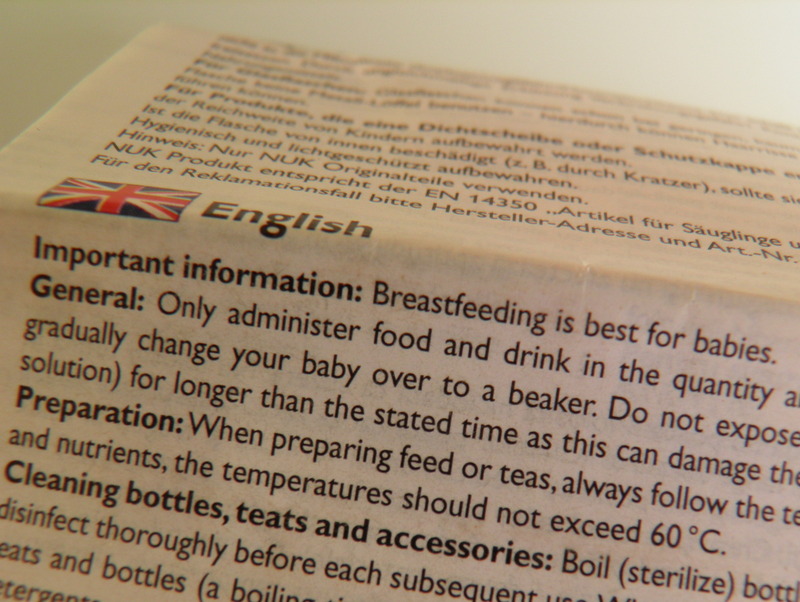 I didn’t read it but I had a feeling I just saw the word “breastfeeding” on the bottle manual. Out of curiosity I lifted the paper and there it was. The very first sentence said: Important information: Breastfeeding is best for babies. I was impressed. I have never bought a regular bottle in the USA but this German NUK in Europe came with this interesting massage. Perhaps they should start printing the same message on stuff here in the States rather than bombarding me with Enfamil formula in the mail immediately after my son’s birth which I find annoying and creepy – how the heck do they know my name, my address, and the fact that I just had a baby? STOP sending me free Enfamil, I don’t want it! Don’t you get the message – breastfeeding is best for babies. Period. Hahaha. I felt the exact same way about the creepy Enfamil in the mail! Yes, breastfeeding is best!